The five detainees were released after paying fines. Five Georgian citizens who were reportedly going on the backpacking tour in the Truso Gorge of Georgia were detained by the Russia-controlled so-called border guards on August 29 for the “illegal crossing of the border” between Georgia and its eastern occupied Tskhinvali (South Ossetia) region. The so-called security agency of Tskhinvali has responded to the illegal detention shortly. “Five citizens of Georgia: Beka Maghradze (DoB 1988), Ketevan Maghradze (DoB 1989), Mzia Gomouri (DoB 1992), Vakhtang Gubeladze (DoB 1997) and Gia Baghdoshvili (DoB 1996) have been detained in the vicinity of the Keli lake. All of them live in Tbilisi”, the agency reported on the same day. 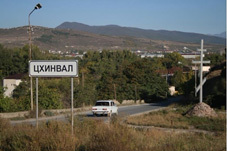 The so-called agency added that another citizen of Georgia Giorgi Kharazishvili (DoB 1951), who lives in the village of Chvrnisi, was detained in the village of Balta, Tighvi district on the same charges. The man was released on the same day. Reportedly, Georgian citizens were going on their backpacking trip in Truso gorge when detained. They have been released after paying fines. The Russia-controlled border guards detain Georgian citizens quite often for the “crossing of the border and release them in most cases after paying a fine which amounts to about 30-32 USD. Russia has been triggering conflicts on the territory of Georgia for many years. After the Russia-Georgia 2008 war, Russia recognized two Georgian regions of Abkhazia and Tskhinvali as independent republics. Since then only Venezuela, Nicaragua, Nauru and Syria joined Russia in its recognition. The War in Abkhazia from 1992 to 1993 was a war between Georgian government forces for the most part, and Abkhaz separatist forces, Russian armed forces and North Caucasian militants. The separatists received support from thousands of North Caucasus and Cossack militants and the Russian troops stationed in and near Abkhazia. Between 13,000 to 20,000 ethnic Georgians and approximately 3,000 Abkhaz have been reported killed, more than 250,000 Georgians became internally displaced, or refugees and about 2,000 are considered missing. Among the missing, about 1,500 are ethnic Georgians, up to 200 are ethnic Abkhazians and about 100 are ethnic Ossetians. 101 bodies have been identified and transported to Georgia over the course of last years. The Russia-Georgia 2008 War was a war between Georgia, Russia and the Russian-backed self-proclaimed republics of South Ossetia and Abkhazia. The war displaced 192,000 people and while many returned to their homes after the war, 20,272 people, mostly ethnic Georgians, remained displaced. 35 Georgians and 6 Ossetians remain missing since the war.